hue is a wireless, app-controlled lighting solution with the so-called bridge as a central element. The bridge is connected to the router and communicates wirelessly with up to 50 LED light sources, which can be dimmed, switched on and off and - depending on the model - be changed in light colour. See Weather for more possibilities. It is recommended to use the Philips App, Android/IOS, to check the installed HUE system and to discover new lamps. Only the Hostname/IP-Address and the User ID are used. The ID to reference this library for Output objects and Programming the UserID. The IP address of the bridge. The UserID to use for command send to the bridge. If the UserID does not yet exist it must be Programmed. To get a generated Username from API 1.14 or higher this field must be set to 114 or higher. The internalipaddress can be used as Hostname in the setup dialog. 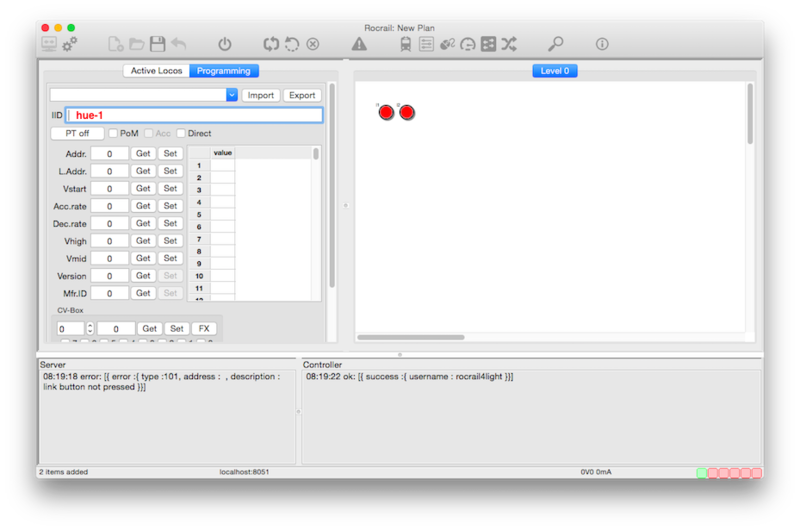 Just push the PT Button on the Programming Tab to add the new User ID in the Bridge. 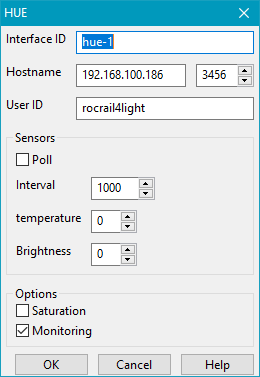 Do not forget to use the right IID, Interface ID, incase more Command Stations are defined in Rocrail. Too short user ID's are rejected by the bridge. The Version field must be set to 114 or higher to get a generated username. 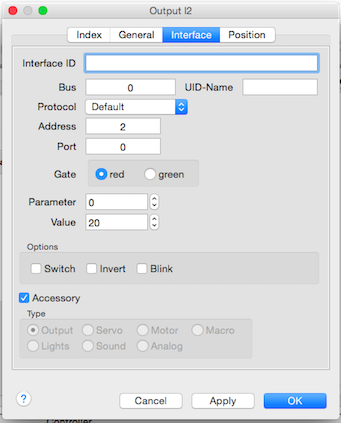 The Interface ID of the HUE library. The parameter is used to set the Hue of the light if set greater then zero. Not all light types, like LUX, do support this option and will report a parameter error. Activates the alert effect "lselect"; The light is performing breathe cycles for 30 seconds. The control in HUE is type independent but recommended is to use type "light" for advanced rendering in Rocview. The "Iris" size depends on the brightness of the lamp if output type is set to light or backlight. Make sure the Render Smooth option is active.